No 1 Bestseller! 14 weeks in the bestseller charts! I’d never fostered a pregnant teenager before – they were usually looked after by specialist ‘mother and baby’ carers. However, none was free when Jade (aged seventeen) was thrown out by her mother and made homeless. I agreed to look after Jade for a couple of weeks until a mother and baby carer could be found. As soon as Jade arrived her behaviour made me very worried. Despite being pregnant she stayed out late at night, drank heavily and smoked. She also got into trouble with the police. I tried talking to her about her behaviour but it did little good. I knew the social services were monitoring her to see if she was capable of looking after her baby, and as I feared they didn’t think she was. Proceedings were started to take Jade’s baby from her and place her for adoption. Jade and I were devastated. I knew Jade loved her baby but she couldn’t look after her and it seemed there was nothing I could do to help. England has the highest teenage pregnancy rate in the developed world and while this is the story of one of those teenagers – Jade – it could also sadly be the story of many. “…Another triumph…fresh and timely, showing the human story behind an acute social problem. Beautifully paced and well-observed…deserves to be a bestseller. 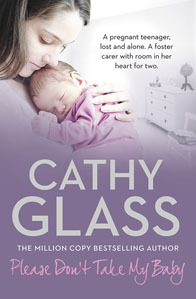 “Excellent read, Cathy Glass is such a joy to read and this latest is a page turner. Loved it!